I don’t do consulting, and there’s no sales pitch here–I’ve got nothing more to sell you. The goal of the seminar is to put you in a room with like-minded people and to really push to create practical breakthroughs that you can turn into action. 10 to 12:30–I summarize my thinking on how ideas spread, on permission and on Purple Cows. 1:15 to 3–We take turns reviewing your website, your mission, your marketing message, etc. No holds barred. Really and truly. 3 to 4:30–I talk about my new book (out in May) and we go even deeper into your particular issues. The goal is that by the end you’ve got the same tools I do, so you can analyze your own organization without my help. At the first seminar, on the 8th of January, I’ll be running a non-profits only seminar in my office in Dobbs Ferry, NY (about 40 minutes from NYC). This seminar is free and there are only 33 seats available. If you run or have a great deal of influence at a non-profit organization, I’m inviting you to come spend the day in my loft. Because it’s free, you sort of need to apply by sending me a note. 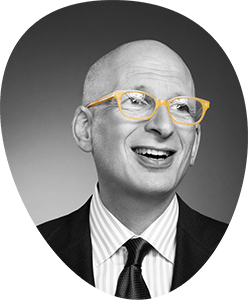 Write to sethgodin@yahoo.com and use the word TRANSFORM in your subject line. Click here for mail. Tell me what you do and how this might help you. I apologize in advance if I can’t fit in everyone. It’s nothing personal! At the second seminar, on the 28th of January, we’ll also convene in my office. This event costs $1,000. You can bring a co-worker at no charge. There’s a 100% money back guarantee… if you don’t think it was worth it, just ask and I’ll refund your money. (This is have never happened before, by the way). If you’d like to come to this one, write to me at sethgodin@yahoo.com and use the word PRACTICAL in your subject line. Click here for mail It’ll probably sell out, so you should hurry. When you write to me, I’ll probably send you a link to an infoblog that will answer most of your questions. I’m pleased with the deliberate way that Dyson is systematically reinventing stuff we figured was stuck forever. Dyson UK – The CRO1 range. Just finished a book and produced a play (the 4th grade musical!). Final performance is Wednesday. After that, I’m going to post two seminars in January and one in February… first come first served. Keep your eyes peeled. Thanks for your patience during this output drought. As Ensight – Jeremy C. Wright points out on his blog, my advice is for sites trying to reach the mass market. Of course, you shouldn’t be trying to reach the mass market, should you? Now, if your niche is, say, poodle lovers, then the advice stands. But if your market is IT folks or active online researchers or Mac users, it’s a different story. In general, if you’re trying to reach everyone, you’ll reach no one. If your slice of the market is horizontal relatively to technology, then my initial thought stands.